Taken from the Fortress the route easily becomes clear. The Fortress was strategically constructed so sit on the highest point in the plain and is situated roughly halfway between the overhanging Great Wall and the Taolai Gorge. To find the Gorge, although as a crack in the earth it is not visible, one simply needs to follow the Wall that extends southward from the Fortress leading seemingly towards the far Qilian Shan Mountain Range. Above + Right: The Great Wall of China Fortress of Jiayu Pass as seen in November 2007. An extension of the Fortress wall runs from its South-Western corner through the arid plain to the Taolai River and its steep Gorge, an impassable barrier in the Hexi Plain. A Full Google Earth Supported Map of No1. Beacon Tower by AsiaReport.com. 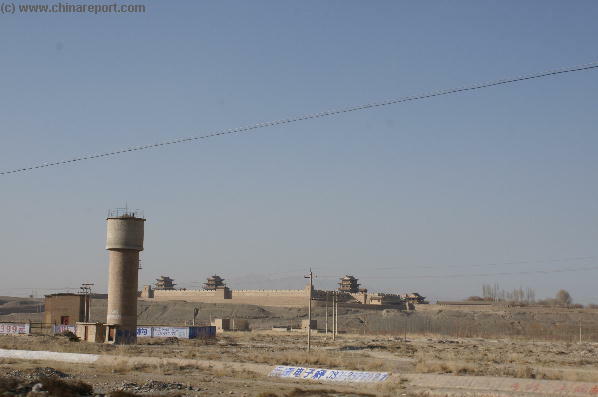 Above: Today a railway line intersects with the mud remnants of the wall south-west of Jiayuguan Fortress. The Line is not the main Lanzhou to Urumqi Railroad but a smaller line which turns into the Mountains. The small and remote border town of Jiayuguan is famous in the history of Central and Eastern Asia as the western border crossing of the Silk Road into China. 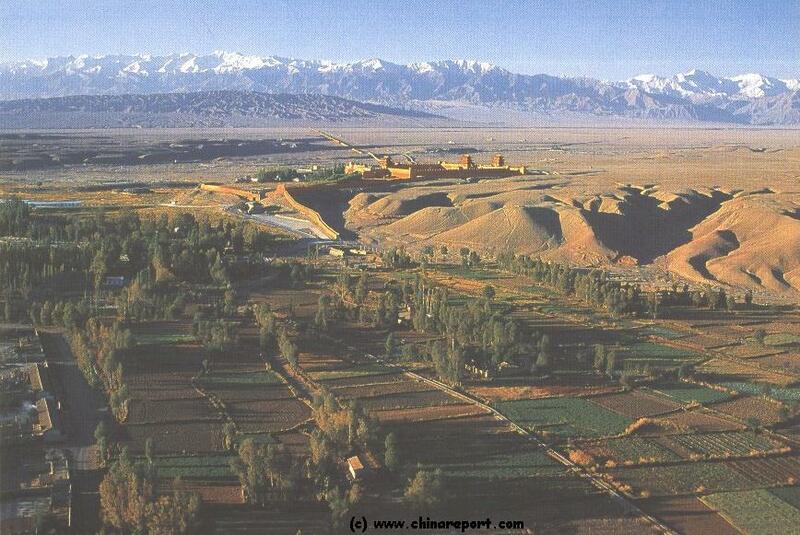 It was so re-established around the year 1368 AD, when Ming Armies drove the last Mongolian Loyalist Troops of the Yuan Dynasty out of China through the Jiayu Pass. Consolidating it's gains over a short period there after, the Ming then declared their Ming Dynasty (1368 AD - 1644 AD) with its Capital at Nanjing and forthwith ordered a massive reconstruction and reinforcement plan for the Great Wall of China. Crucially, this plan included the construction of massive Bastion attached to the Great Wall, a fortress built to serve as a military base as well as a stop-gap to rule the strategicly vital Pass. 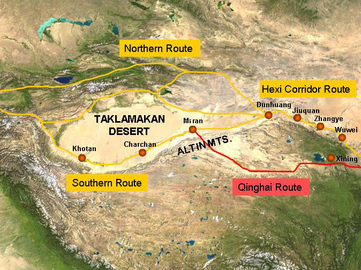 Schematic depiction of the main pathways o/t silk road passing along the north-rim of the Giant Tibetan Plateaux and the secondary path bypassing the Hexi Corridor through Xining. 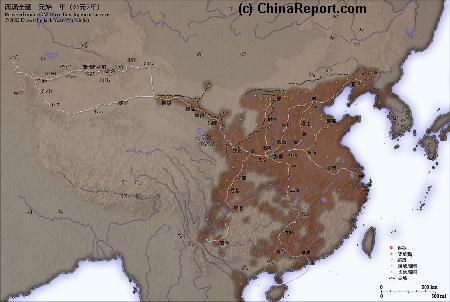 Map of the Han Dynasty Empire (206 BC - 220 AD) at its highpoint. Clearly visible on the Map are the outlines of Gansu Province and the Strategic Hexi Corridor leading West. In the South-West Han Chinese are at the Dadu River, for almost 2 millenia the border with Tibet. what is called the Hexi Corridor was officially Chinese Territory with its own Military Administration at first, later followed by Civilian Administration. In those early years several Han Armies were stationed along the Hexi Corridor, near Dunhuang with the strategic goal of dominating the area beyond. And so it happened, laying the foundations for what much much later became known as the Silk Road. During the high times of the Han Dynasty the Chinese realm extended much farther even as far as the Caspian Sea. 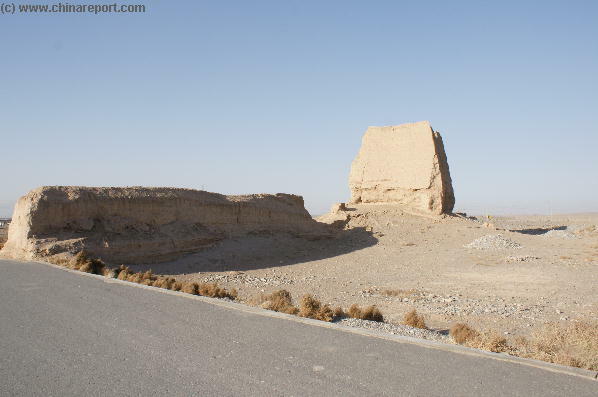 During this time the Han constructed a first version of the Great Wall of China, which included beacon towers running along the length of the wall inside the Hexi mountain corridor to pass Jiayuguan and end at the last blazing beacon of the Time: Dunhuang. One Man sheltered from the winds by a small canvas tent watches over traffic at the crossing at all Times. the famed beacon tower is an absolute must-see when visiting the modestly sized City of Jiayuguan and its Fortress. 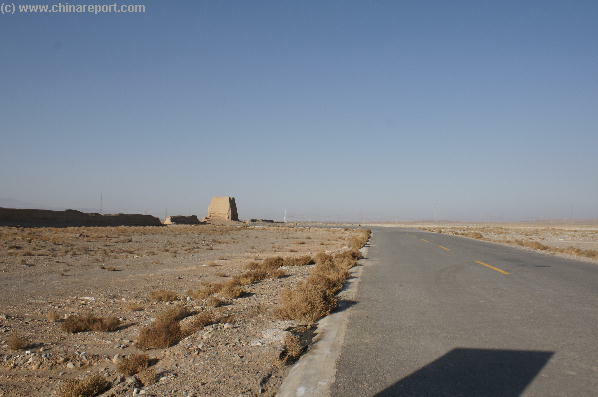 Find it located at only a small distance South South-West of Jiayuguan, as can clearly be seen on accompanying maps. 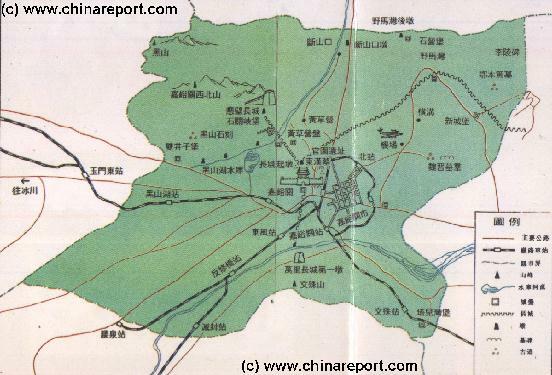 A schematic Map Drawing of JiaYuGuan City Prefecture in Gansu giving a complete overview of JiaYuGuan City, the location of the Fortress UNESCO World Cultural Heritage Site and the construction of Great Wall of China Defenses in the immediate vicinity such as the Overhanging Great Wall and No.1 Beacon Tower. 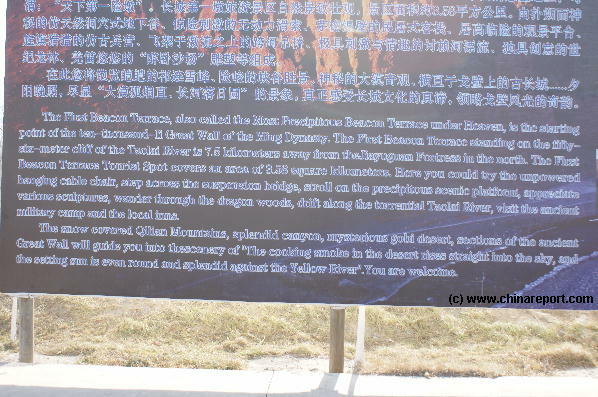 Follow the links to navigate along each individual section of the Last Bastion on the Great Wall, and the attached Recreational Area. remained Chinese, becoming part of the Kingdom of Wei. During the Tang Dynasty the Empire once again extended far beyond the now familiar borders at Jiayu Pass and Dunhuang, reaching far along the Silk Road into Asia. Among the famous persons that saw the Fortress in operation are Bentos De Gois, a jesuit priest and Papal Envoy who died at nearby Jiuquan (Suzou) the administrative center and herding point for all those requesting permits to travel further on into China. Gorge or even the presence of the Taolai Gorge may remain entirely unclear due mainly to the geographical features of the local landscape. The best explanation for this phenomenon is to say that at this point inside the Hexi Corridor, the plain is relatively flat and apart from a few low hills and towering mountains on the horizon quite featureless. Furthermore at most times, the simmering heat combined with glare of sunlight makes viewing anything in the distance quite difficult. Therefor, this steep gorge, in fact a sheer drop carved out of the loess ground is not clearly visible from anywhere in town of even from the Fortress. 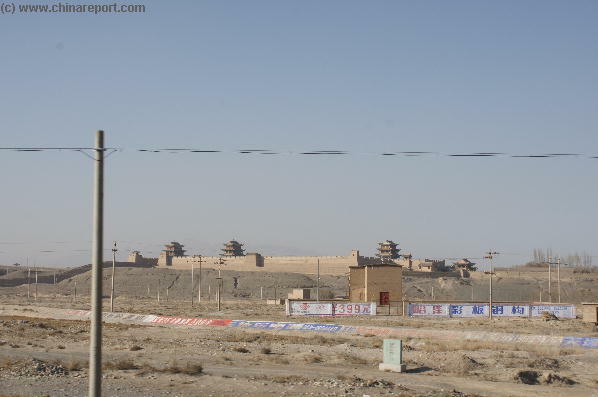 The best way to orientate ones self on its location is to start navigating from the Jiayuguan Fortress itself, the center of the local defenses. In this respect, a visit to the No.1 Beacon Tower combines well with a Tour of the Fortress. A reasonable order would be to head out to the Northern edge of the defenses at Jiayuguan, which is formed by the (reconstructed) 'overhanging arm great wall of China'. From there head southward to the Fortress which is clearly visible at all Times. Take a lenghty tour of the Fortress, then once more turn South-ward to end your sightseeing with the Taolai Gorge spectacular, which can even include a breath-taking zip-ride on a cable across the Gorge. 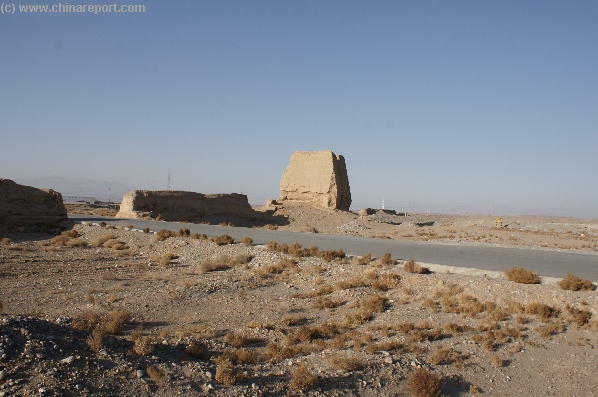 View of the JiaYuGuan Fortress from the South where an extension of the Fortress Enclosure Walls can be seen running away to the South South-West. This is the Wall that terminates at Taolai River and its deep Gorge (Photo:November 2007). 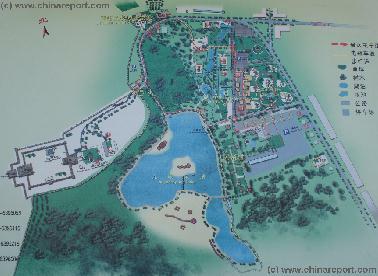 A Map Drawing giving a complete overview of the JiaYuGuan Fortress UNESCO World Cultural Heritage Site and recreational Area in JaiYuGuan, Gansu Province of China. 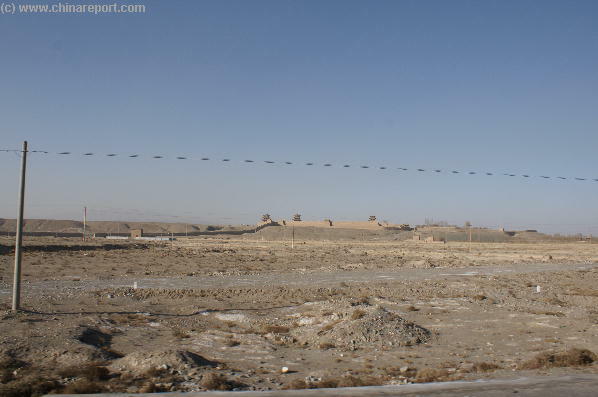 An old photo of the Jiayuguan Fortress taken from the North and the vicinity of the overhanging arm great wall site. From this vantage point the wall running south across the plain seems to lead towards the Qilian Mountains, however a gorge runs in between. As can be made out from adjacent and other maps, immediately south of the Fortress is but what seems like wasteland. Through this cut a few roads and railways. To be exact, driving instructions from the Fortress to the No.1 Beacon Tower are as follows: First, drive out of the main gate of the large parking space reserved for the Fortress and turn south (SSE) ward until reaching the intersection with the next main road, which is Lanxin (Lanzhou to Xinjiang) West Road. Then, turn right and head westward along Lanxin West Road. Not very much further, this road is joined by the G312 provincial road which comes from the south and makes a steep bend to actually extend in the same direction as the earlier Lanxin West Road. You are now officially outside the city limits. 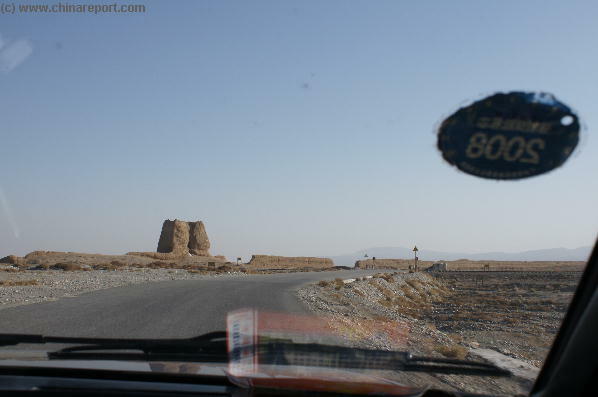 The rest of the route follows fairly easy and there is not much fear of taking a wrong turn. There are none. Head further down G312 provincial road and cross via a small tunnel underneath the first railroad line, which is by chance the main railway line in these regions connecting Lanzhou in Gansu and Urumqi in far western Xinjiang-Uygur Autonomous Region. It has just been modernized to carry China's modern bullet trains past this spot and beyond to Anxi, Dunhuang, Hami (Kumul), Turpan and Urumqi. You might want to stop and wonder at this modern marvel. Railway crossing at the Great Wall of China in the plain outside of Jiayuguan. An eroded but still massive mud watchtower still reminds passers by of the significance of the location. Heading into the plain one does get the peculiar sensation of turning ones back on the last bits of civilization and heading into a seemingly endless desert-like plain which is nevertheless bordered behind by some incredibly steep and high snowcapped mountains. Anyone not used to these surroundings indeed does feel like crossing some sort of invisible border beyond of which lie undoubtedly rough lands in which life is considerably harder. ancient times for the defense of this strategic spot in the Hexi Corridor. Although the Fortress stood atop a Hill overlooking the plain, at the same time dominating the high ground and protecting the local water-source, this by no means ensured that the vital hexi mountain corridor leading eastward into China was entirely closed off. At least not physically. Thus, after the central core of the defenses, the Fortress, was complete, more defensive structures were added radiating out from the Fortress. was the location of the First and westernmost Fire-beacon tower of this widened line of defense. Qilian Shan are only the most outer 'foothills'. They do not impress as foothills but as darkly towering guardians of a forbidden and icy world. Beyond the Fortress and the Wall in the West extends nothing but a widening plain and a featureless simmering horizon. No vegetation to speak of appears anywhere in sight. In the North the dusty and uneven tops of the Mazhong Shan, beyond which lie treacherous sands and desert of the Gobi within Inner-Mongolia, seem equally unattractive. Even today the landscape feels like it might be a last bastion and outpost of Civilization. Just slightly beyond this railway track the G312 reaches a smaller freshly paved road which turns off to the South. Turn off and follow this road. The road you are now traveling on has remained nameless so far but was constructed solely for the purpose of reaching the No. 1 beacon tower. follows up to the Gletsjer to terminate at Sanchakou and a bend of the S215 provincial road high in the mountains. This is the train ride to catch when planning mountaineering adventures on the mountain. As mentioned, this is the last real obstacle in a total journey of around 8 kilometers. Only some 500 meters from the railway intersection, just inside the mud-wall one is stopped by the official tourist guard of the needs to pay an admission fee, after which the car is allowed to follow the small road and end up at the Taolai Gorge and last (or first!) Beacon Tower now visible in the distance.